Simply put, no one was better than Tua Tagovailoa in 2016. Sure, he didn't lead the state in passing yards or touchdowns — in fact, he ranked fourth in Division I in both categories — but no one could dispute his worth to the Saint Louis football team this season. 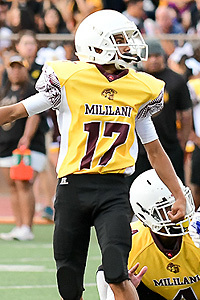 That was evident just three games into the Crusaders' season, when Tagovailoa put on a show for the ages, accounting for nine total touchdowns in a 64-44 win over Interscholastic League of Honolulu rival Punahou. 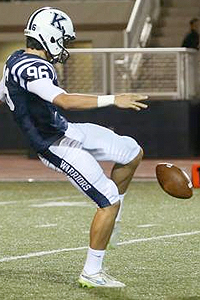 The 6-foot-1, 212-pound quarterback completed 31 of his 42 pass attempts for 447 yards and ran 15 times for 104 yards. 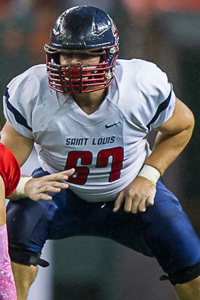 He threw six touchdown passes without an interception, and ran in three other scores to help Saint Louis rally from a 13-0 first-quarter deficit. 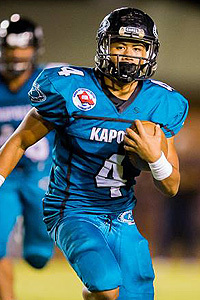 "I've been watching high school football as a fan, as a coach and as a player since the 80's and I haven't seen a quarterback with a more dazzling array of skills," Kapolei coach Darren Hernandez said. "He has everything: his zip and spin that he has on his passes is unreal — it's on another level — he runs like a running back, he also has great vision and instincts and knows when to run. He feels pressure and can escape from it." 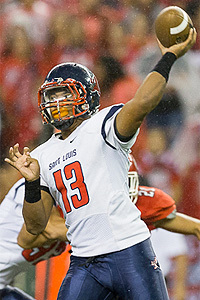 Tagovailoa, who was named ILH D1 co-offensive MVP, led Saint Louis to its second straight ILH D1 title and put on a memorable performance in the inaugural Open Division state final. 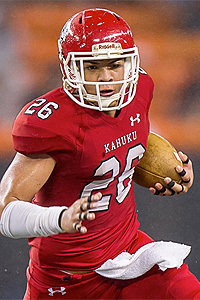 He threw for 243 yards and a touchdown and rushed for a 136 yards on 18 carries — both game-high marks — and another score in the 30-14 win over defending champion and nationally-ranked Kahuku to lift the Crusaders to their first state crown since 2010 and fourth overall. 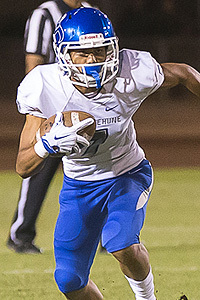 "He's one of the most prolific talents that we've ever seen in the state," Kaiser coach Arnold Martinez said. 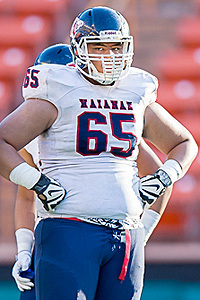 "After they lost to Kahuku last year, to see how he performed this year was really impressive. You could tell that he was on a mission to get that unfinished business completed." For the season, Tagovailoa competed 67.7 percent of his passes for 2,669 yards with 27 touchdowns against just seven interceptions. He rushed for 727 yards and eight TDs on 104 carries — an average of seven yards per attempt. 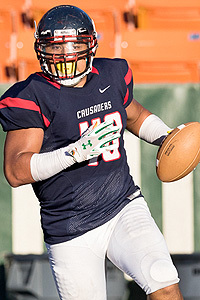 "For the program of Saint Louis, he's another legacy-type player like Marcus (Mariota) was," Martinez said of the former Crusader, now Tennessee Titan quarterback. 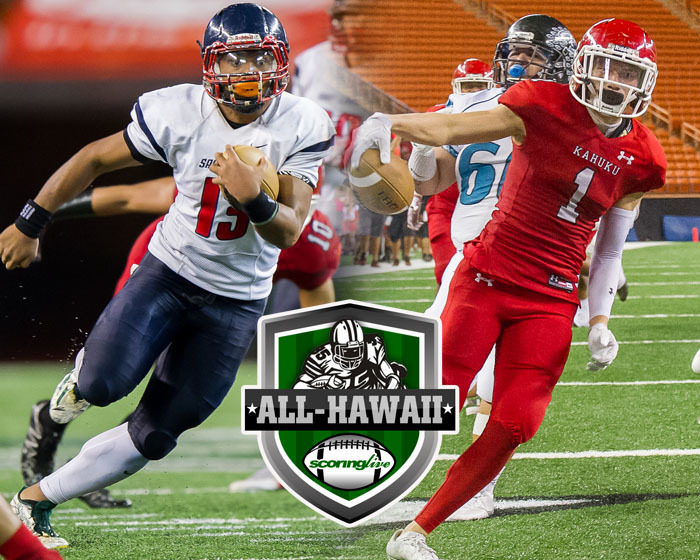 For good measure, Tagovailoa surpassed another former Saint Louis great, Timmy Chang, for the state's all-time passing yardage record. In 31 career games over three seasons, he recorded 8,618 pass yards and 64 touchdowns. In mid-December, Tagovailoa — rated as a five-star recruit and the nation's No. 1 dual-threat quarterback — signed with the University of Alabama and plans to enroll for the spring semester. 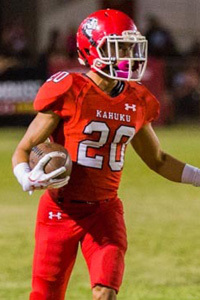 Kekaula Kaniho was number one for the Kahuku football team in a lot of respects this season. The senior cornerback — who wore jersey No. 1 for the Red Raiders — was public enemy No. 1 for opposing quarterbacks. 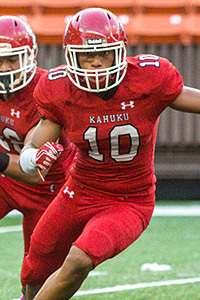 Kaniho, who stands 5 feet, 11 inches and weighs 175 pounds, was one-quarter of a menacing defensive secondary that many considered amongst the best in state history. 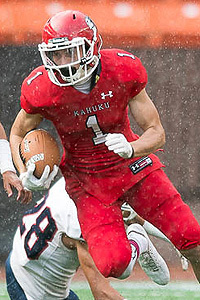 Kaniho, along with fellow cornerback Stokes Nihipali-Botelho and safeties Kesi Ah-Hoy and Codie Sauvao, limited teams to just over 103 pass yards and 8.3 points per game. 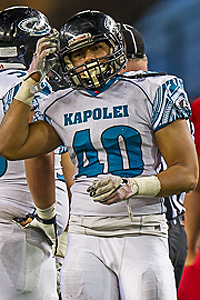 "He's an outstanding player, but they do have a number of them, too," Kaiser coach Arnold Martinez said. "I think he obviously was a great impact player for them and he was one of those guys that you have to plan for and you have to know where he's going to be." Kaniho registered six interceptions on the year and, perhaps even more amazing, returned all but one of them for a touchdown. 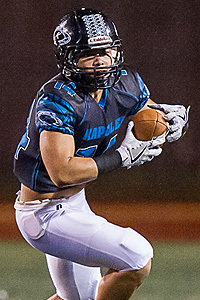 "Having five pick-6's is pretty rare for any high school kid," Kapolei coach Darren Hernandez said. "I looked it up and that is actually tied for second all-time in high school football in the country — not just this season, but all-time." 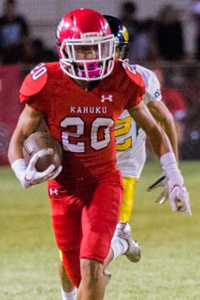 All six of Kaniho's interceptions came in a five-game span, including two in a 63-0 rout of Leilehua in Kahuku's playoff opener. 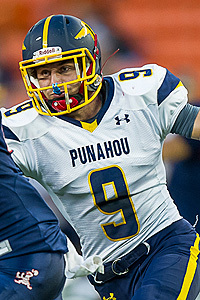 He scored on a 33-yard interception return in the first quarter and also broke up two other passes in that game. 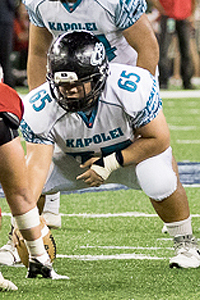 Kaniho forced a fumble in a 54-7 win over Kapolei in an Open Division semifinal and also recovered three fumbles on the year. 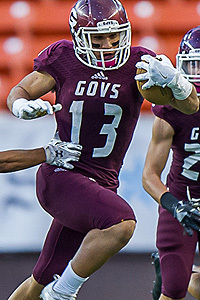 His dominance wasn't limited to defense; he also notched a 65-yard kickoff return for a touchdown in a 50-7 win over Aiea in mid-August. "I didn't think a player could overshadow Stokes Botelho, who is such a great return man and an all-around great player, but boy, this year Kaniho really did outshine everybody, including his teammate," Hernandez said. 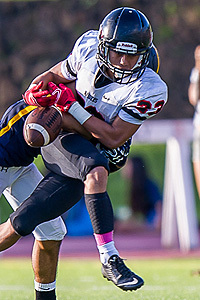 Kaniho is the latest in a long line of standout defensive backs for the Red Raiders. 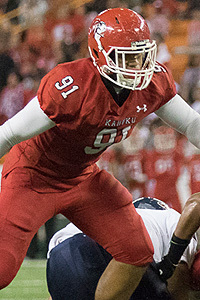 "It just seems that every year Kahuku has a player of this caliber," Hernandez said. 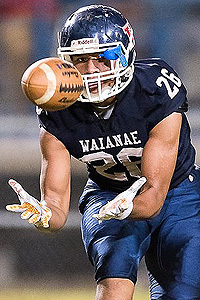 "You go back to Kawe Johnson and Keala Santiago and then Stokes and Kaniho this year; They always have the best group of defensive backs, which sets them apart. 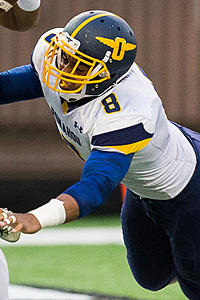 Their defensive backs get it done not only as far as tackling, but I think more importantly they make things happen with the ball in their hands." The Red Raiders posted six shutouts on the year and outscored their opponents by an average of more than 35 points per game. 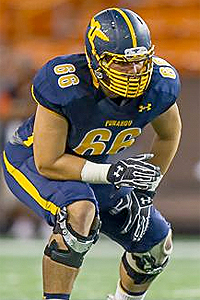 Nihipali-Botelho and Ah-Hoy join Kaniho on the All-Hawaii D1 first team defense, while Sauvao earned honorable mention. Perhaps it was only fitting that the first-ever Open Division state championship was won by the man who has more victories than anyone else in the history of prep football in Hawaii. In his third stint as coach of one of the state's premier programs, Cal Lee reached the pinnacle once again. 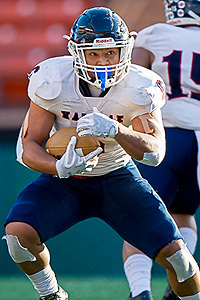 Lee, 70, guided the Crusaders to their second straight Interscholastic League of Honolulu crown and a 10-1 season that culminated with their first state title since 2010 and fourth overall. 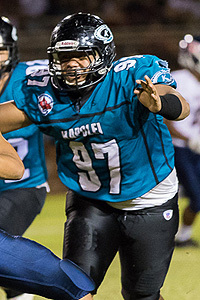 "Cal Lee is the godfather of high school football and in a lot of ways he's a mentor to me," said Kapolei coach Darren Hernandez, who served as an assistant under Lee with the now-defunct Hawaiian Islands arena football team in the early 2000's. "He's just a different cat. He understands people, he understands the game and he understands how to plug in the right pieces." 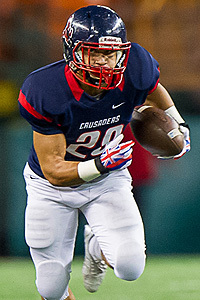 Saint Louis opened the year by winning its first five games before a 33-20 setback against Punahou. However, it went on to win its final five games despite Lee undergoing hospitalization for kidney stones. 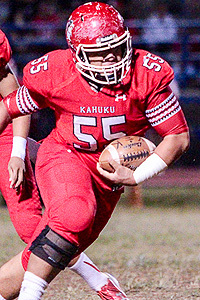 The Crusaders ended Kahuku's streak of 24 consecutive wins over Hawaii opponents with a 30-14 win in the Open Division final. "What a way to cap a season by getting over the hump and getting it finished the way they did," Kaiser coach Arnold Martinez said. "Yes, you've got your field general in Tua (Tagovailoa), but coaching is not that easy. A couple of players don't win you games. There's a psychology behind it, a culture behind it, a motivation behind it and you've got to have that focus and get your group focused and that's never an easy thing. It's easy to say that you've got talent, but they did a great job of keeping this group focused and keeping their eyes on the prize. I think (Lee) did a great job, somewhat masterful, and it just kind of shows you why he is the legend that he is in high school coaching." Lee has a career coaching record of 264-39-5.